Check out these garishly gorgeous nails, which belong to my super creative and highly talented pal Heledd Jones. Heledd has always been an arty creature (she won the BBC Blast Scrap Fashion Competition back in 2007) so it came as no surprise to me when I found out she designed these badboys herself. Yes they’re gaudy and completely impractical, but who cares? I WANT THEM! 1. Apply a basecoat to your nails. 2. Apply a coat of white nail varnish to each fingernail. 3. Apply a second layer of white nail varnish to just one nail. 4. 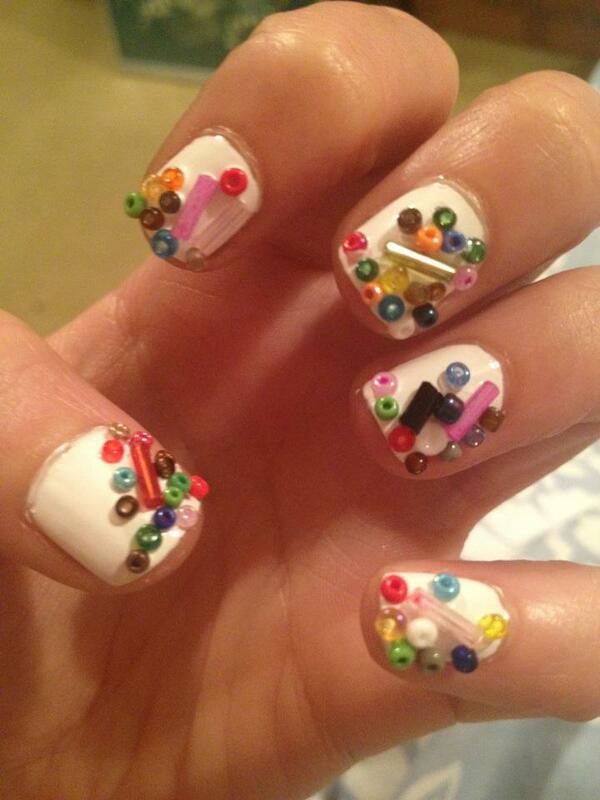 Using tweezers, place the beads onto the freshly painted nail straight away. Repeat step 3 & 4 on each individual nail. 4. Lastly, apply a gloopy layer of top coat to each nail, making sure to go cover the beads so that they stay in place. Serena Williams sports ace nail art at Wimbledon 2012!